I originally wrote and published this post on Friday 16 October but my blog crashed and the whole post was gone. I’d written quite a heartfelt post, and in just one second all those words were gone. I don’t have the heart or patience to rewrite the whole thing, and maybe it’s for the best that some of those words are now gone. At any rate, I was able to copy-paste an extract that was posted in the newsletter. How many times has that word been thrown around when people describe me, or comment on something I’ve done (or rather, not done as well as I would like). You’re a born perfectionist, Clem. Even my star sign says so; virgo, the ultimate perfectionist, nothing’s ever good enough, always has to try harder, do more, be better. My whole life I felt like that word was ill-suited to me. I never felt like I was doing anything right anyway – I was never the prettiest girl in class, never thin enough, never good enough at maths or sciences, never very techy, my brain is a sieve and I get flustered and shy, I’m not the social butterfly I wish I could be, and on and on and on – in fact I was far from perfect. But I guess even the fact that I don’t feel good enough to deserve the brand of ‘perfectionist’ just goes to show how much of a true perfectionist I am. Sometimes though, I wish I could rebrand myself a ‘failurist’, which seems much more apt. I like to think I’ve made small improvements: I don’t get into quite a panic about getting stuff right the first time around. But then if I do mess up something, the mental self-flagellation begins: I can’t stop thinking about what I could have done better, what small detail I overlooked, how lazy, how stupid, damn stupid I can be. I imagine that’s what it’s like to be a postman attacked by a small chihuahua that’s bitten into your leg and refuses to let go until it’s tasted blood. And boy, do I bleed. My biggest failure to date has been haunting me for six months. I loved a man, and tried so hard for almost three years to make our relationship last, and it didn’t work. I gave it everything I had – and I still lost. I can’t tell you how much that hurts. It’s the hardest lesson I’ve learnt so far: that sometimes, no matter how long or how hard you try, you will lose, because some things are out of your control and that’s ok. Let go. I know these macarons look far from perfect. Macarons require a lot of practice, and i’m still learning. Clearly, i’m overzealous with the filling, but hey, I like my chocolate, ok? I’m just happy these feet, are properly baked, and taste effing fantastic. Taste first, looks second. The macaron batter should be thick but run off the spatula and spread slightly if left in the bowl. Spoon the mixture into a large piping bag and secure the top. Place the piping bag in a tall drinking glass or mug to help support it as you spoon in the mixture. Pipe 2.5cm (1 inch) circles onto baking trays lined with baking paper, leaving room for the macarons to spread slightly. It’s important when piping the macarons to hold the piping bag directly above the baking tray, not at an angle, and to pipe in one smooth motion. Then take one baking tray at a time and drop it onto the counter or table from a small height and drop it once more. Repeat with the other trays. 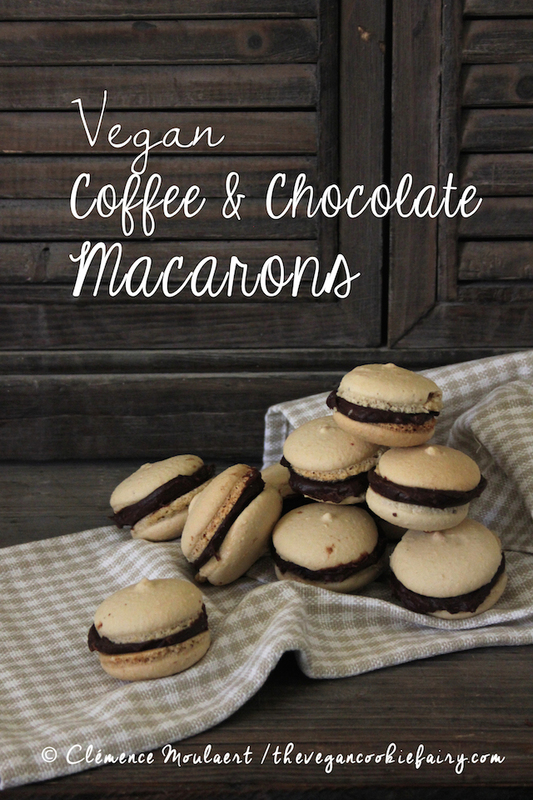 This helps the macarons have an even shape and aids in developing the “pied” or foot. With a moist finger, gently press down any tips left on the surface of the macarons. Preheat the oven to 100ºC (200ºF). Bake the macarons on the top shelf of the oven, one tray at a time, for 30 minutes. Keep checking on them to make sure they brown too quickly but do NOT open the oven door. This will ruin the macarons. When the 30 minutes are over, switch off the oven and leave inside for 15 minutes, then open the oven door and leave for another 15 minutes before taking out of the oven. 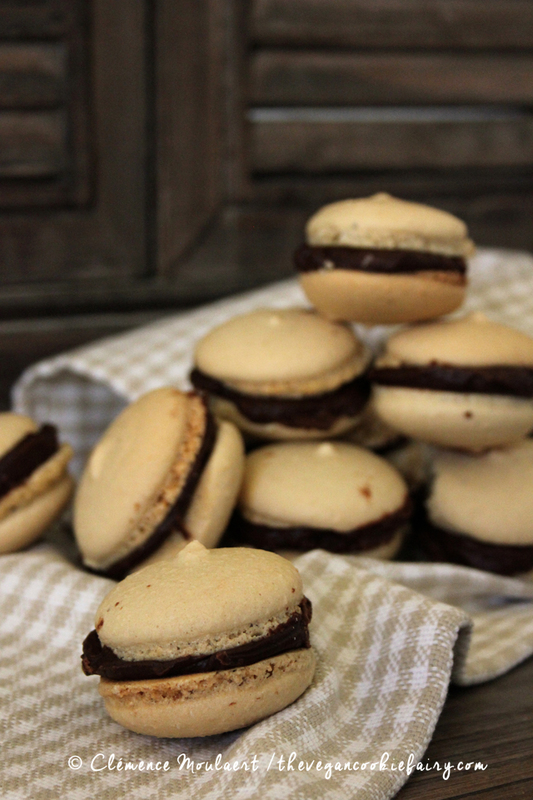 Once your baking tray and macarons are completely cold, you’re ready to sandwich them together with your filling. The macarons should have a nice, crisp shell, a ruffled foot or pied around the bottom and a firm underneath. WOWZA! These look incredible!!!!!! I wish I could grab one thru the screen!